The below letter to Morgan Stanley's Board of Directors in the Fall of 2007 hastened the identification of a successor to John Mack as CEO; however, nothing meaningful was undertaken to correct the situation, thereby representing tacit approval of the collaborative unlawful activities by Morgan Stanley, with the assistance of Kirkland & Ellis. As a result, their malicious acts toward Mr. Young and his loved ones were only amplified. Insiders said Mack was so enraged by this correspondence to the Board, he demanded to "do everything necessary to crush Spencer Young! ", seeking favors from friends at Wachovia and Paragon Commercial Bank, who were Mr. Young's principal banking relationships for his investment properties, and even his buddy and board member, Erskine Bowles, who was then President of UNC - Chapel Hill. Unfortunately this entailed predominantly illegal activities including fraud, racketeering, extortion, sabotage, corruption and even assassination attempts as part of the cover-up. John Mack is an exceptionally evil man, as are those in North Carolina who helped him, and are commonly referred to as part of the "Mack Mafia", which is why North Carolina may be the most corruption-laden state in the United States. Little did Mr. Young realize at the time . . . things would get so much worse -- eventually leading to Morgan Stanley's "murder" of Mr. Young's wife of 24 years, the fraud-laden grand larceny theft of Mr. Young's investment properties and the orchestrated utter dysfunction among family members. I bring to your attention a matter of utmost gravitas, which warrants your attention because “the Elephant in the Room" can no longer be ignored. The FBI and the Manhattan District Attorney’s Office have been provided information on instances of fraud, corruption, racketeering, extortion, sabotage and activities having elements of antitrust, the particulars of which will be made available to you shortly. Metaphorically, these illicit activities are the “Elephant”, and are the manifestation of a Machiavellian scheme initiated five years ago by two Morgan Stanley employees – Warren Friend and John Westerfield (with the assistance of Tony Tufariello). Ø Destroy the dreams for countless others. Importantly, these transgressions were carried out with the knowledge and oversight of senior management at Morgan Stanley, with certain individuals at the law firm of Kirkland & Ellis serving as accomplices. Indeed, if the corrupt practices and deceitful undertakings employed against me are as pervasive and unfettered as I believe they may be, the consequences could be dire for many, and potentially undermine Morgan Stanley as a going concern – because no person and no corporation is above the law. What is especially troubling is John Mack was apprised of the misdeeds shortly after his arrival as CEO; however, instead of rectifying what should otherwise have been a pedestrian matter, the frequency of orchestrated transgressions increased, and their ferociousness only amplified. Ø Perhaps certain law enforcement officials. 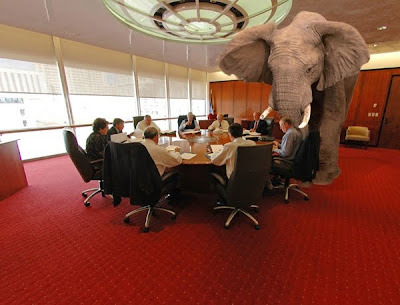 So this rogue Elephant (metaphorically ridden by Morgan Stanley) has been chasing me throughout this enormous Room for nearly five years, intending to wear me down so I will collapse from exhaustion, and thereby enable this pachyderm to finally crush me under one of its gargantuan feet. Without question, the progenitors of this elephas maximus will seek to dismiss this matter as the mere ranting of a disgruntled former employee – however, upon examination, you will soon realize the seemingly implausible indictments are not only true, many are readily corroborated. And this is why the perpetrators have gone to outrageous lengths to cover up their massive fraud, and in so doing, destroy lives and livelihoods. This matter bears many similarities to the Watergate scandal – for instance, the initial transgression was relatively minor; however, the ensuing instances of corruption and cover-up exacerbated the situation, such that there may now be significant consequences – and as you know, the truth was eventually uncovered and led not only to the demise of an administration, it cast a pall of public suspicion on the Executive Branch that some say never went away. I am committed in my quest for justice, evidenced by having inscribed a Latin aphorism in the coping of a water fountain at a property I am redeveloping on Franklin Street in Chapel Hill, North Carolina – it reads “Magna Est Veritas Et Praevalebit” (translation: “Truth is Mighty and Will Prevail”). So my caveat to you, the Board of Directors of Morgan Stanley, is this – resist the predictable inculcations to dismiss this devolving “MorganStanleyGate” without due inquiry – for by doing so, you will tacitly endorse the shrouding of truths that will otherwise be self-evident, and thereby undermine the “unalienable rights [to] life, liberty and the pursuit of happiness” for many – more to follow. These indictments have been made with much forethought, and certainly not cavalierly – refer to attached definitions for context, and note that they are provided to convey the nature of such serious charges. repugnant scandal that ensued was quite simply the result of failing to make due inquiry before drawing conclusions.